From the heights of League Two with Bury to guiding Guyana to their first ever Concacaf Gold Cup, it's been a fine season for Neil Danns. The Shakers midfielder has made 35 appearances in the English fourth tier this season, as Ryan Lowe's side chase promotion back to League One at the first attempt. However, a result 4,400 miles away on Saturday, might just be the highlight of an already impressive campaign after Guyana beat Belize to seal their qualification for this summer's tournament. "We'll be going there not just to take part but to compete. 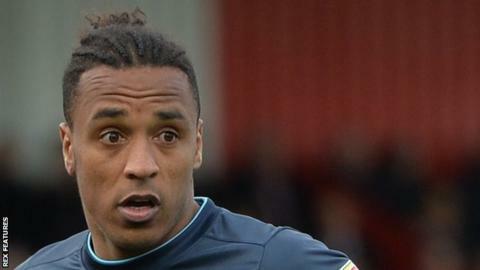 Even just to win a few games over there and have an impact," Danns, 36, told BBC Radio Merseyside. "It's huge. The importance stems beyond football it's obviously still a developing country so for the nation to qualify for such a prestigious tournament, it's fantastic for all involved. Hopefully it inspires the next generation of youngsters." The former Crystal Palace and Bolton man made his first senior international appearance late into his career when it was discovered he qualified to play for Guyana, who are managed by former Derby County defender Michael Johnson. "I was called up about five years ago from one of the recruitment guys over there who was born in England but his father is from Guyana, and he's been involved in football," he continued. "He found out from a player who plays for Guyana, who's also from England, that I had some Guyanese in me and he called me up and asked if I would be interested in representing the country. "I thought what a fantastic opportunity, having never visited the place, it would be to see where my grandfather was born." Danns scored a penalty in Guyana's 2-1 Concacaf Nations League win against Belize to take them to the Gold Cup - a tournament consisting of 16 teams from North and Central America and the Caribbean. He admits it was good to achieve success after some doubts when he first played for the nation. "When I first went over, a lot of people asked why I went over there. Even people in football didn't take it as seriously because it's a small nation and no one had really heard of them," he added. "After the first time I went I knew it was going to be a process but I knew getting involved in it, it would be something I would love to be a part of. "After five years, to have made it to a major tournament, to be party of that and to score in every competitive game we'd played, to get qualification was unbelievable." The Concacaf Gold Cup takes place from 15 June to 7 July.